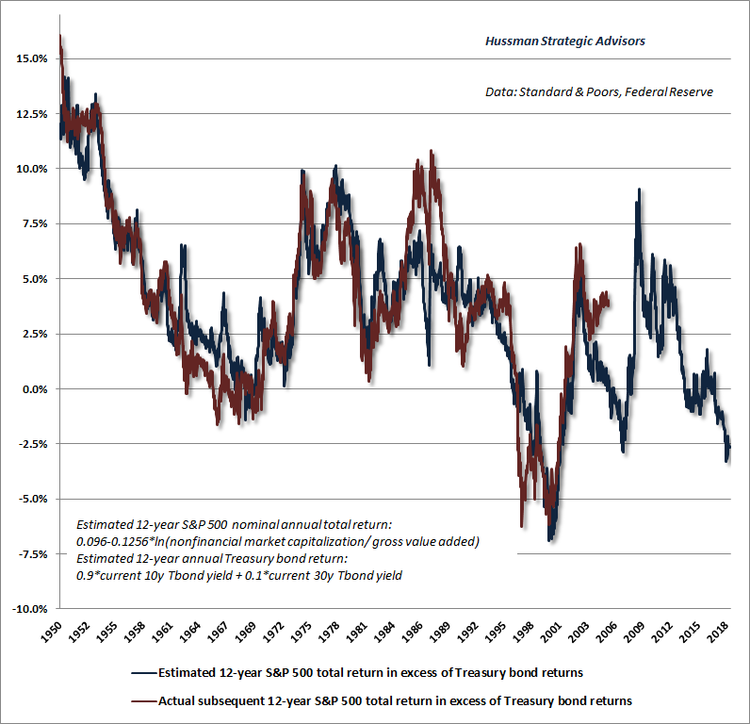 Doug Hussman has come up with a future market performance indicator so accurate, it’s difficult, over a 50+ year term, to see where the predictions ended and the actual performance began. The catch? It’s deadly accurate foretelling stock market returns over the coming 12 years. Not next week, not next year. The one big takeaway? Over the next 12-year period, the S&P 500 is forecast to lose about 3% annually – for 12 years – to treasury returns. The overall profile of market conditions continues to feature: 1) hypervaluation on the measures we find best-correlated with actual subsequent S&P 500 total returns, coupled with 2) continued deterioration in our measures of market internals, which are the most reliable tools we’ve found to gauge the psychological inclination of investors toward speculation or risk-aversion. It bears repeating that valuations are remarkably informative about the prospects for market returns over horizons of about 10-12 years, but are nearly useless by themselves over shorter segments of the market cycle. Over those shorter horizons, market fluctuations are driven mainly by investor psychology. To measure that psychology, we can take advantage of the fact that investors tend to become indiscriminate when they are inclined to speculate. Speculative psychology is revealed by uniformity of market action across the full spectrum of securities and security-types, while breakdowns and divergences reveal growing risk-aversion. Presently, we observe a particularly dangerous pairing of extreme valuations and deteriorating market internals. Coming off of one of the most extreme periods of overvalued, overbought, overbullish enthusiasm in market history, and coupled with hostile yield pressures and widening credit spreads in the debt markets, the current set of market conditions is easily among the most hostile in history. Raoul Pal: What Will Happen to Pension Funds During the Next Recession?